She’s a doctor of dire diagnoses. By the time patients are presented to Khaoula Mazouzi, M.D., most have advanced cancer, often metastasized to several sites. It is left to her to break the news – and she has about 20 minutes to do so, thanks to a caseload that has her seeing an average of 30 patients per day, in a regional hospital with just 35 beds. The Algerian oncologist makes the most of every interaction with each patient, acting as their psychologist and advocate as well as their doctor. Long wait for a CT scan and MRI at her government-run center? As a medical school student, Mazouzi learned how to pull some strings at a private hospital. No money to pay for treatment? She quietly approached some philanthropic-minded contacts. And now, when treatments fail and all options are exhausted, she helps her patients in the final chapter of their life. “I chose medical oncology because I wanted to improve the quality of life for cancer patients. I think I’ve succeeded in my mission so far,” Mazouzi said. Mazouzi has been a pioneer of palliative care in Algeria, where traditionally patients were sent home to die, without any additional medical support. A young physician in the final months of her residency at Ibn Badis Hospital of Constantine, in northeast Algeria, Mazouzi received a fellowship last summer from the European Society for Medical Oncology (ESMO), which allowed her to travel to Brussels to spend a month learning about how palliative care is delivered at the Jules Bordet Institute. The experience not only altered her approach to end-of-life care, it changed practices throughout her hospital. Upon her return, Mazouzi initiated new educational and administrative programs that she continues to lead today. Now, she hopes to transform the landscape of cancer research in her native country, after an equally eye-opening experience at Weill Cornell Medical College. 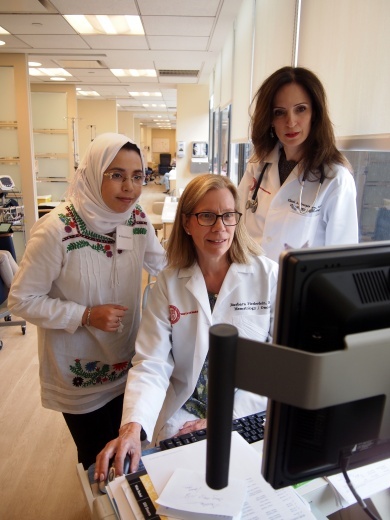 Khaoula Mazouzi, M.D., reviews a patient’s records with clinical care nurse Barbara Fiederlein, and IDEA mentor Eleni Andreopoulou, M.D. As part of the Conquer Cancer Foundation’s International Development and Education Award (IDEA) mentorship program, Mazouzi participated in the 2015 Annual Meeting of the American Society of Clinical Oncology (ASCO) in Chicago. Eleni Andreopoulou, M.D., was selected by ASCO to be a mentor as part of the program. Along with co-mentor Anne Moore, M.D., she hosted Mazouzi for a three-day visit at the Weill Cornell Breast Center. 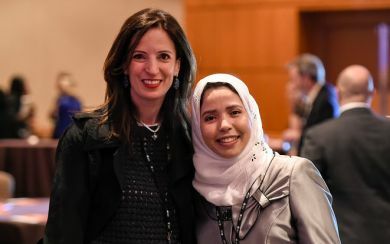 The purpose of the IDEA program is to support the professional development of early-career oncologists in low- and middle-income countries around the world, Andreopoulou said. Upon the mentees’ return to their home institution, it is expected that mentors and mentees remain in contact and pursue opportunities for consultation and collaboration. While at Weill, Mazouzi met patients and specialists in several fields, attended tumor board meetings and educational lectures, and learned about how clinical trials are conducted. But one of the highlights of the trip was a visit to the lab of Evi Giannakakou, Ph.D., and a discussion with research fellow Giuseppe Galletti. Despite a life-long dream of becoming a scientist, Mazouzi has never had the opportunity to step foot in a research laboratory. “I now know, for certain, that this is what I’m going to do,” Mazouzi said. Mazouzi would like to build clinical research programs in Algeria, where there is currently very little infrastructure to support it, and a dire need for even basic training to enable physicians to conduct clinical trials. A recent surge in interest and investment in cancer care in Algeria gives her hope. In the past four years, the government has built two new regional hospitals, invested heavily in radiotherapy machines and personnel – doubling the amount of trainee doctors – and has footed the bill for many targeted therapies, including some that are quite expensive, Mazouzi said. Pharmaceutical companies have also invested in training doctors and scientists to conduct genetic testing and immunohistochemistry at specialized centers. “I don’t think it’s impossible. It’s very possible. But we will need new government investment, training and international collaborations,” Mazouzi said. Those collaborations could start with Weill. Mazouzi hopes to continue to work with her mentors at the Breast Center as she builds new programs at her own hospital. Andreopoulou said she was happy to participate and was herself inspired by the ambitious young doctor. ← Breast Center Team at American Society of Clinical Oncology Annual Meeting 2015 – Key Happenings!